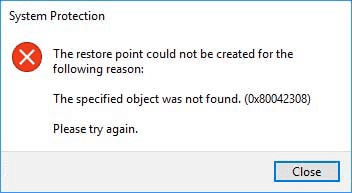 You face System Restore Error 80042308 message while trying to create restore points for the PC. Generally, bad areas on the drive or on the Volume Shadow Copy Service are regarded the culprits for this issue to occur. But they are not the only reason. There are few more reasons which are equally responsible for these messages to pop-up.